Peter was born in Warwick, educated at KES in Stratford and was a keen rugby player for Old Leamingtonians in his earlier days. For 28 years he was in the fire service in Leicester, London and as Director of Operations at the Staff Training College in Moreton-in-Marsh. 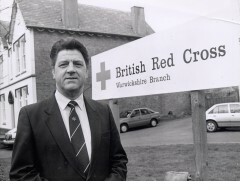 Following retirement he joined the British Red Cross as County Director for Warwickshire. He was responsible for setting up the Fire and Emergency Vehicle Service which has served local residents on numerous occasions following floods, house fires and power cuts. Into his ‘second retirement’ Peter continued his voluntary local support by fundraising for Red Cross Emergency Appeals and organising the Christmas Charity Card Shop in Leamington. Peter was involved in the community in a number of other ways: Chair of Barford Parish Plan Committee, Trustee of the ‘Barford in Need’ Charity, Board member of South Warwickshire Together Partnership supporting many of the regeneration projects associated with Promoting Inclusion and Enterprise ( PIE Projects) which included setting up a network of Village Liaison Officers in Wellesbourne, Lighthorne and Barford. 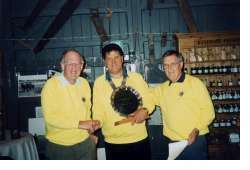 Peter first became a Lion sixteen years ago and assumed many different roles in both welfare and fundraising work. 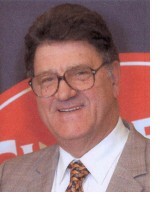 He served as Club President and will be remembered as a driving force behind many of the Club’s initiatives. He also acted as secretary and a source of so many vital contacts for the Rural Show; cooperating with other clubs in the District to run Santa’s Grotto, and touring the streets with our Christmas floats. 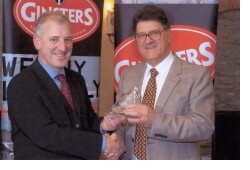 Peter was a worthy winner of the Ginster’s “Real Honest Peoples Award” in recognition of his active fundraising for many causes. Peter served as Chair of the 2005 Raft Race Committee and it was disappointing that he did not live to see the re-run of the raft race in September after its earlier postponement. In a poignant tribute to Peter’s work, Lions, rafters and supporters paused for a moment of quiet reflection before the race began. Peter was a very caring man, always keen to challenge and promote issues for those less fortunate. He brought a sense of justice and fair play to those he came in contact with. He can never be replaced. Our Lions activities will continue but we shall all be better for having seen Lion Peter’s shining example of service and commitment to his fellows. I can’t remember the day I first met Peter but I can remember where it was. The Joseph Arch over a pint. Anyone who knew Peter will know he enjoyed visiting the local to enjoy a pint and chat with friends. I liked Peter from the first day I met him and from day one we were destined to become good friends. Over the years I got to know him well and shared with him his love of wildlife and the country; it was Peter who first introduced me to the Lake District and I have many happy memories of those times spent walking around the lakes together. He had found out early in his life that to serve was better than to receive, he was a tireless worker for many local and national charities and was happiest when helping others. Peter would never refuse a plea for help – typically it was Peter who offered his own car as a taxi service to town when the local village store closed. His immediate thoughts were for the people of the village who would be in difficulty. Peter was a totally unselfish man with many fine qualities not least of all his compassion and humanity, always prepared to give you that most precious of commodities, his time. Many of us have sought his advice knowing he would give the issue careful thought and offer sensible and practical advice. He had that rare ability to make the problem seem that little bit smaller by offering words of wisdom and calm reassurance. Peter’s health had not been the best for several years but he never allowed this to get in the way of his passion for helping and always retained his sense of humour. Peter was immensely proud of his family and over the last few years was delighted by the addition to his family of three beautiful granddaughters Megan, Darcy and Hannah, and would often be seen proudly taking them for walks around the village. Our thoughts today are with Peter’s family. They can feel truly proud of Peter’s many achievements, and a life spent unselfishly helping others. The folk gathered here today are a testament to the admiration we have for him. Peter would not have wanted us to feel sad today. He lived his life to the full and would want us all to do the same, so let us celebrate Peter’s life today and be thankful that we were able to share our lives with such a fine man who has left his mark on all of us. I know that the world, especially Barford, will be a poorer place without him. I, like the rest of you, will miss him greatly. Peter has left his family and friends with many happy memories. I think myself lucky to have known such a man and consider it a privilege and an honour to have been called his friend. “Thank you” doesn’t begin to cover what I and my family want to say to all of you who have shown us such love and support during the past few weeks. Cards and flowers are still arriving on a daily basis, and your visits and telephone calls are really helping us to come to terms with Pete’s sudden death whilst on holiday. We had enjoyed 5 days of a holiday we could only previously have dreamed of – until he won the prize. He visited places he had always wanted to see, and his life ended the way he would have wanted. We shall all miss him dreadfully, as I know will many people in the community. Friday 23 September was a very emotional day, but it was made so much easier for us by those of you who did the catering, the Wellesbourne Lions and by the Reverend David Jessett for his kindness and the wonderful service. Donations to Spinal Research in Pete’s memory are in excess of £2000. A very sincere thank you to you all. This page was added on 03/10/2015.